The Exhibition continues until Saturday 9th May 2015. 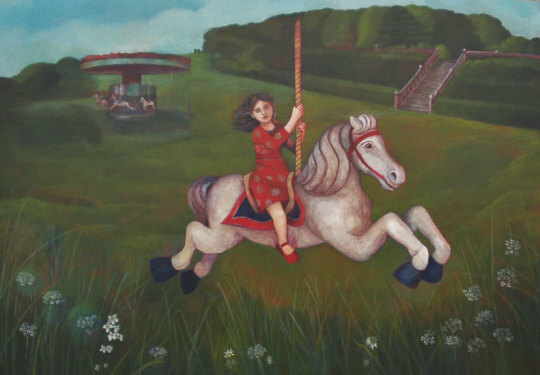 Earlier this year, I spent a bright wintry day visiting Nicola Slattery in her secluded rural Norfolk home and studio, the latter within a converted barn. The outlook onto a paddock was enlivened by playfulness of family dog and cat amidst scurrying chickens and squawking geese, with glimpses through hedges of solitary iconic sheep. Emerging from a late afternoon in the studio, I was at once awed and assaulted by a wondrously scintillating, silent and spacious night sky. The intimate nature of this landscape – a retreat from urban angst, noise, traffic – is inextricably at one with the visionary inscape of her art. This wonderfully diverse exhibition contains acrylic portraits on board of singular women – some identifiably self-portraits, others with elements of self-portraiture but also with diverse familial resemblances – but all archetypal figures of compelling enigmatic inwardness and what the artist calls ‘this thoughtful peacefulness’. In Gathering Fish – a metaphysically nourishing painting of a kind of pre-Raphaelite surreality – an imposingly tall, slender woman stands on a curving strand as “a person nurturing quite animated fish in her arms – rather than being about to cook them!” Amid subtly intermixed elemental colours of seascape and sky, the red ribbon (in the subject’s hair) and antique-styled indigo dress are startling hallucinatory accents. Solitary women are envisioned in extreme or stark, mythically allusive settings: in an Antarctic bay of almost savagely subdued colours, a young woman intuits The Call of the Deep from the peaceable presence nearby of a giant whale; from the ambiguously sorrowful and joyous countenance of a woman wearing extravagant Pearls (alluding in its painterly clarity and heightened simplicity of detail to Vermeer), reflected light in the eyes glows with the glimmer of seed pearls (alluding obliquely to a mystical ‘pearl of great price’). Another picture depicts a mesmerisingly wide-eyed young woman – her beautiful figure aslant in the picture frame – being bombarded by Night Flowers from a background of dazzling darkness. This powerfully original contemporary composition carries overtones of the art of the medieval miniaturist as well as a fiercely gentle Expressionist feeling. 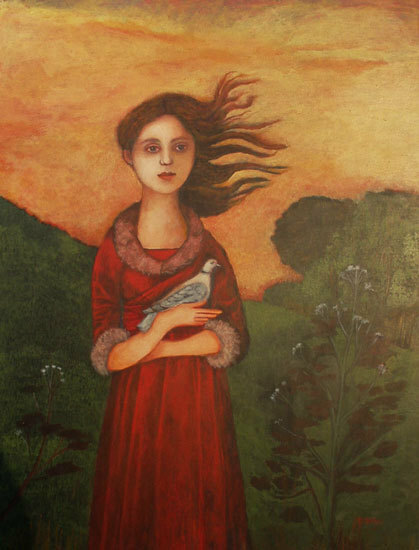 Above all, this painting expresses the poignancy and depth of Nicola Slattery’s timelessly symbolist search for true identity. Philip Vann: author of the critically-acclaimed Face to Face: British Self-Portraits in the Twentieth Century, and numerous books and catalogue essays on modern British and Irish art.